NEW Epcot and Animal Kingdom Touring Plans added to Character Locator! For Epcot I’ve incorporated the new Anna and Elsa meet and Frozen Ever After into my Touring Plans and created at great new Epcot 2 Day Touring Plan that will allow you to meet all the best characters and ride every ride with no stress. It’s my recommendation that you should heavily consider spending 2 days or at least 1 1/2 days at Epcot to be able to see Joy/Sadness, Baymax, Anna & Elsa, Belle, Frozen Ever After, Soarin’, Test Track and much more. I’ve also created a new Late Night plan for Animal Kingdom that includes all the new late night entertainment. It includes the Jungle Book show, but I really don’t recommend the show. I prefer the smaller acts like Viva Gaia and the Harambe Acrobats and you MUST watch the shows on the Tree of Life! Kilimanjaro Safaris has been a mixed bag for us. If you can be on the truck right at dusk, you can still see many animals mixing about. If you go later, you’re reliant upon the trucks headlights to see animals. We’ve had giraffes and rhinos walk right up to the truck late at night and we’ve ridden where we can only see a bunch of dark shadows. I still believe the best time to ride is park opening when the animals are starting their day and the temperatures are cooler. Be sure to check out Character Locator for the updates and the new plans! I’ll be creating even more plan options throughout the week. Get all the latest KennythePirate Disney news and planning advice in your inbox! Kinda confused where do you see the plans at ?? Hey Kenny, just checked out the new plans on character locator and they look great!! 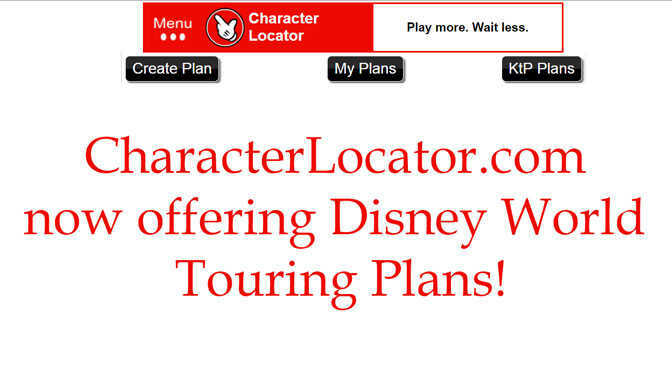 I tell everyone to purchase character locator for planning their trip. Two quick questions, what kind of line can we expect for Olaf and for Max and Bolt in HS? Second, when are you hearing rumored as start of Rivers of Light? We will be there first week of October and Jungle Book got such poor reviews we are struggling to put together an evening at AK with our 5 yo. Thanks!!! One question on Epcot 2 day plan. We have an 8:15 breakfast at Garden Grill and this day we plan on doing that side of the park. Do you recommend FP for Soarin and go straight to Joy and Sadness or do you think we would be okay to do Soarin first and then Joy and Sadness? We extended our vacation so we could have 2 days at Epcot to make sure both kids were able to do what they wanted to. BTW we love your site. We just sat down with the kids this weekend and they loved being able to see all the details you provide. I’m still laughing that my 9 year old son’s top three attractions he wants to do at MK is Flag retreat, hall of Presidents and Swiss Family Robinson house. My 5 year old daughter on the other hand she wants all the wild rides but is only 42 inches tall. I’d go to the characters and use FP for Soarin as plan suggests, but you’ll still likely not leave breakfast before 9:30am.